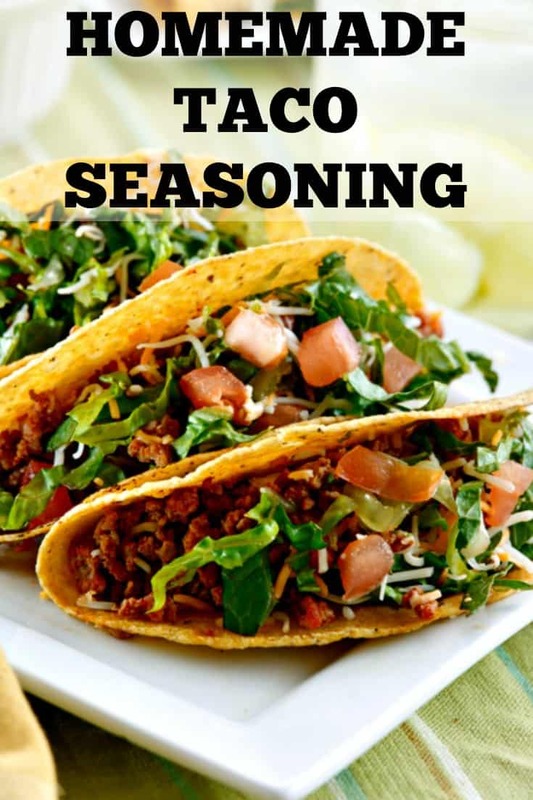 Homemade taco seasoning is so easy to make! I like the ability to control the amount of sodium since those store-bought packets use too much. Also, by making your own, you can also adjust the spices to your family’s taste preferences. We love cumin, for instance, so I tend to add even more. If we’re entertaining adults for dinner, I bump up the chili powder and sometimes add cayenne, too. As with my other homemade mixes, like homemade Mrs. Dash, Seasoned Salt and Old Bay, I usually double the recipe. 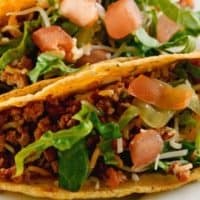 It keeps nicely in an air-tight container in the pantry so you can always have some on hand to use in tacos or some of the other ideas below. Bean Dip: In a small saucepan over medium heat combine 1 can refried beans, 2 tablespoons homemade taco seasoning, and 2 tablespoons of salsa. Stir frequently until warm and transfer to a bowl to serve with tortilla chips. Taco Potato Chips: Preheat the oven to 400°. Slice a potato thinly and toss the slices with 1 tablespoon taco seasoning and 1 tablespoon olive oil, combined. Arrange slices on a baking sheet and bake until the edges begin to turn golden, about 5 minutes. Flip and bake an additional 3-5 minutes, until crispy. Remove from oven and immediately transfer to wire rack to crisp while they cool. Taco Soup: Sautee 1 lb. ground beef and 1 onion, chopped, in the bottom of a large stock pan. Add 3 tablespoons taco seasoning, 2 cans diced tomatoes (undrained), 1 cup frozen corn kernels, 1 cup black beans, and 1/4 cup diced green chiles. Bring to boil then reduce heat and simmer for 10 minutes. Add additional taco seasoning to taste. Serve garnished with crushed tortilla chips, diced avocado, a dollop of sour cream, and a wedge of lime. Taco Salad: On a plate, layer 2 cups torn lettuce and top with 1/4 cup each corn kernels, black beans, sliced black olives, and minced green onions. (Optional: add strips of cooked chicken or other leftover protein.) 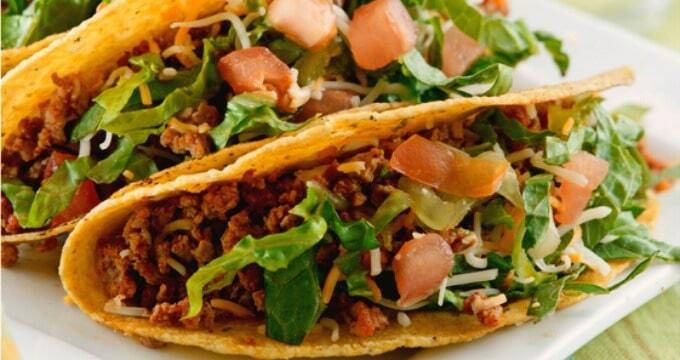 Make a taco dressing by combining 2 tablespoons salsa, 1 teaspoon taco seasoning, and 1 tablespoon sour cream. Homemade taco seasoning mix is so easy to make and skips the fake ingredients in the store-bought stuff. Combine all ingredients in a jar and shake well. Store in a cool, dry place. To make taco meat, add 1 cup water and ¼ cup mix per pound of ground beef and simmer until most of the liquid is cooked away. For chicken tacos, cut boneless, skinless chicken breasts into 1-inch strips and toss them with this seasoning mix. Saute, stirring frequently, in 1 tbsp. olive oil until fully cooked, about 7 minutes. 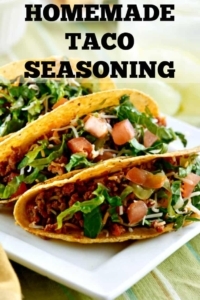 I’ve had homemade taco seasoning pinned on pinterest for ages, because we love tacos, too, but i do NOT like the icky preservatives + stuff in store-bought seasoning. thanks for reminding me that i need to get my rear in gear + make some soon! Wow. This is great! This probably has less salt then the store bought brand too. Thank-you!! I don’t know how much less sodium it has as written, but you could definitely lower it by using low-sodium beef granules. I regularly use Nu Salt for part of the seasoning salt, then up the cumin and chili pepper because I love those two flavors so much. I absolutely love this my dear!! So simple and so yummy – Mexican food holds a very special place in my heart… err, stomach! ?